Great News - you can now pay your Studio account online! Just go to 24studio.co.uk and click on "Your Account"
and then click on "make a card payment"
It's really that easy! Making a payment is only a click away. 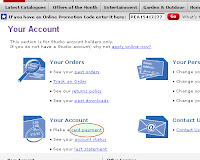 Visit 24studio.co.uk where you can also change your details, track an order and see your account status.